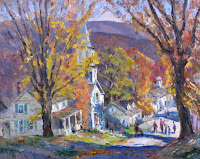 The auction featured the estate property of Elenita Bauer, who, along with her husband, Dr. Tom Bauer, was personal friends of Curry Bohm and Bohm’s wife, Lillian, sometimes accompanying the artist on painting trips to New England. In addition, the Bauers were patrons of the arts in Indiana, active in the Indianapolis Ballet Society and the Hoosier Salon, and as charter members of the Brown County (IN) historical society. Darin Lawson, CAI, Auctioneer, stated “This group is, without question, the finest, and most complete, single owner collection of Curry Bohm’s work ever offered.” The collection included a variety of Bohm subject matter and styles, ranging from a Bohm oil painting shown in the first exhibition of the Brown County Art Gallery in 1926, to a rare bromide photograph from 1922 with multiple exhibition tags from the 1920’s, to an emotive pastel from 1935 entitled “Man’s Inhumanity to Man”, depicting a depression era homeless shelter. The Bohm collection also featured a New England scene entitled “Off for the Mackeral Run”, which set a new record for a Bohm harbor depiction, doubling high estimate at a sale price of $12,000. The auction also included decorative arts, Americana and antique furnishings, and the quality of the items available drew considerable interest from across the globe. The Wickliff site, including the online, photo catalogue received over 50,000 hits in just the week preceding the auction, with over 500 live and online bidders including registrants from China, Japan, Taiwan, Turkey, Lebanon, several countries in Europe, and all of North America. Other highlights of the sale included a turn-of-the-last-century Regina Corona Model 35 disc changer music box. The disc-changing mechanism was inoperable, but the Regina exceeded high estimate by $500, selling for a hammer price of $8,500. A unique and early 19th century sugar chest, with a later, painted red finish, drew considerable pre-auction speculation regarding the origins, had phone, live and online bidders and sold for $4,000. The Bauer collection also included Native American decorative arts, acquired during a time of residence in the American southwest. Featured was an 11”, paint-decorated Zuni bowl, which sold at $1,300. The first category in the Saturday auction included over 100 lots of fine and antique jewelry, including the Bauer collection of Victorian carved stone cameos. The top-selling lot was an oval stone cameo brooch selling with a coordinating, cupid-motif stone bracelet, at $800. There were still bargains to be had, however, in early American pattern glass, Victorian furnishings and oriental rugs. A large collection of Seneca Loop pattern glass sold at low-estimate values, which were, according to Lawson, admittedly conservative. A late 19th century, nice quality Chippendale style dining room group including table, eight chairs, buffet and two linen chests with a pre-sale estimate of $2,500-$4000, sold to a happy buyer for $1,750. A 12′ x 22′ 1920’s/1930’s Persian Sarouk oriental rug was indicative of the current market for traditional-style rugs, selling just above low estimate at $3,500. Wickliff Auctioneers began in 1991, and their auction showroom is located in Carmel, IN. The company conducts catalogued auctions from its location approximately 10 times per year. More information is available by calling 317-844-7253, or by visiting www.wickliffauctioneers.com.